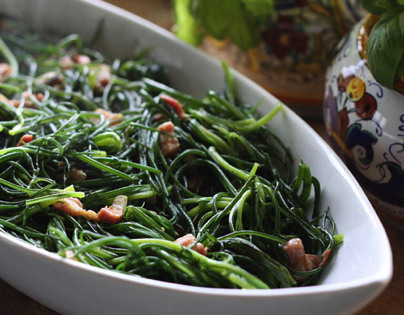 Agretti is an unusual spring green, or swamp grass that grows near the water. Wash the agretti well and cut off the roots and any thick stem pieces, then dry on paper towels. In a large wide bottom saucepan or frying pan, fry the diced pancetta until it's crispy in the olive oil, about 5 minutes. Add the cleaned and dried agretti to the saucepan and sauté the agretti until it softens but still retains a little crunch to the bite, about 6 to 8 minutes. Season with salt and pepper and serve warm. Note: If you find the agretti , try soaking it in cool water for a few minutes after you cut off the roots and before you cook it.